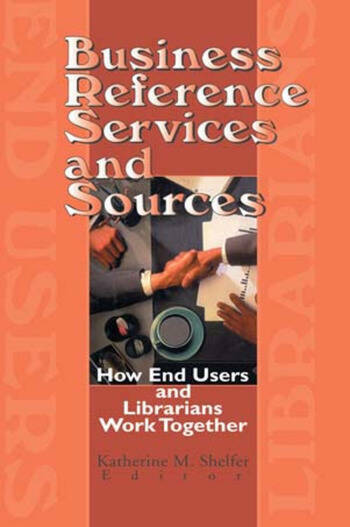 The most proactive source for business reference librarian information on the market, Business Reference Services and Sources: How End Users and Librarians Work Together shows you that the librarian-customer relationship is as synergistic as ever. It gives you timely facts about how librarians and users work together and how those partnerships are built. In it, you’ll encounter group projects done by faculty, students, external users, and non-librarian supervisors and discover an enlightening spirit of collaboration lacking in most research literature today. underprivileged, nontraditional students and bibliographic instruction Today, in our climate of negative ad campaigns directed at libraries and librarians in general, business reference librarians face many challenges, academic as well as professional. But if you’re one of the vocal, proactive supporters of productive librarian-customer partnerships, this book will help you “grow feet” and move out from behind the restrictive comfort of your desk into the world’s classrooms and manufacturing teams. Certainly, Business References and Sources will convince you that collaborative projects between contemporary reference librarians and end-users are alive and well.